As a first-generation American, Wright State nursing student wants to provide care in the Hispanic community within the greater Dayton area. When Rosa Aguilar was growing up, she found herself in doctors’ offices constantly — not due to her own illness, but to serve as a translator for her Spanish-speaking parents. As a first-generation American, it was often expected of her to provide her English language skills to her family and others in her community. While she served as a translator for her parents, she often witnessed errors or misunderstandings from doctors and nurses, “mostly due to discrimination or simply the fact that we were being overlooked,” she said. It was during these difficult visits and hardships she endured with her family that she decided to apply to Wright State to become a nurse. 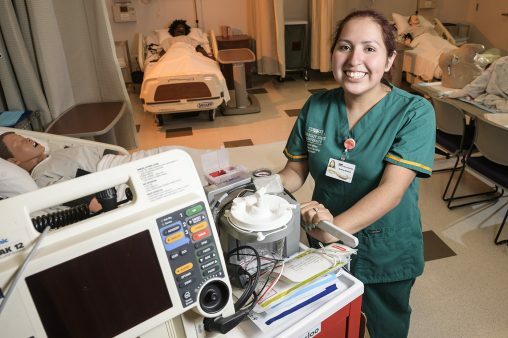 Choosing the nursing program at Wright State was easy, Aguilar said. The campus is just a 10-minute commute from her home in Dayton, where she lives with her parents. But, just a few years ago, Aguilar almost lost her chance to go to college and almost did not even graduate from high school after her father lost his job. Her family struggled to buy groceries and pay their mortgage for nearly six months while her father looked for work. She knew that her dream of going to college would bring her parents nothing but joy and hope for the future. “My parents have worked all their lives to bring me to this point in my life, as a college student,” she said. That’s why it was so important and exciting, Aguilar said, to have received the Rise.Shine. Scholarship, which supports the student success priorities for the Rise.Shine. Campaign, which concluded last summer, raising more than $167 million. With this financial help, Aguilar can focus more on her studies and less about accumulating crippling student debt. That dream, she says, is very specific. Aguilar wishes to become part of the only 4 percent of Hispanic nurses in the United States, focusing her work solely in the Hispanic community within the greater Dayton area. According to the National Association of Hispanic Nurses, as of 2017, only 4 percent of registered nurses are Hispanic. However, the Hispanic population now accounts for about 18 percent of the U.S. population and is projected to reach 30 percent of the nation’s population by 2050, according to estimates by the U.S. Census Bureau and the Pew Research Center. Despite these statistics, the lack of diversity in the nursing workforce remains an issue, especially among Hispanics. “I wish to help alleviate the language barriers between health care and the patient to avoid mistakes and raise satisfaction,” she said. “(As a nurse practitioner), I would like to someday open my own practice dedicated to advocating for immigrant families from different cultures, so that they receive quality care at lower costs and in their own language,” she said. Aguilar looks forward to graduating debt free, and showing her parents how much their support has meant to her. Learn more information about the success of the Rise.Shine. Campaign by visiting wright.edu/riseshine.